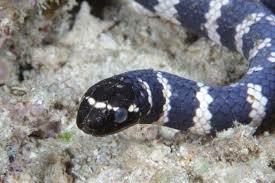 I really like reptiles and snakes and one fascinating species that I have found is the turtleheaded sea snake. These lovely snakes grow to about 75 cm long. They get their name from their short, blunt head that makes them look like a turtle. They come in a wide range of colours, from blue-grey, brown or black and with a range of creamy white or yellow patterns and stripes. Their colours get darker as they get older. This is one snake that you don’t need to be afraid of as their fangs are only 1 millimetre long. They spend their entire lives in the water and only eat fish eggs. They can swim underwater for two hours without taking a breath and have a single lung that goes almost the entire length of the snake. They live in tropical waters throughout northern Australia, Fiji, New Caledonia, the Philippines and Vietnam. Their numbers have dropped recently, but they are not considered to be in danger of extinction. Are there any other interesting facts that you would like to share about turtleheaded sea snakes?